Anyone who has kids and owns a tablet will understand how alluring a touchscreen device is for little'uns, even as young as four. However, while many adults might be streamlining their lives to be more digital, there's still an element of magic in a normal, paper book, especially in the eyes of children. The LeapFrog LeapStart, which will be available for £34.99 from 15 July, is an interactive learning centre for children aged two to seven that combines the best of both worlds. It has a stylus pen that recognises elements in dedicated physical books and speaks aloud to aid reading or for other educational purposes. The device itself is available in two formats, one for Preschool and one for Primary School level kids. The latter, which we saw during a private demonstration, is robust and comes with a pen that allows for finer control. It is directly aimed at children aged five to seven. The Preschool edition, for two to four year-olds, is rounder and has a carry handle. The stylus is a bit chunkier for smaller hands and the tip is not so pointy. The LeapStart works by placing a book in the centre of its clamshell design and the pages have markers that, when tapped by the pen, starts an interaction - be that reading the page or asking a question. For example, a geography section might ask a child to find different flags or landmarks of specific countries. All interaction is performed aloud through the built-in speaker or headphones, with a socket included. The battery is rechargeable through a USB port. There will be 16 add-on books available initially, in different categories and suited for different educational levels. They are priced at £9.99 each and are for nursery, preschool, reception and year one children respectively. 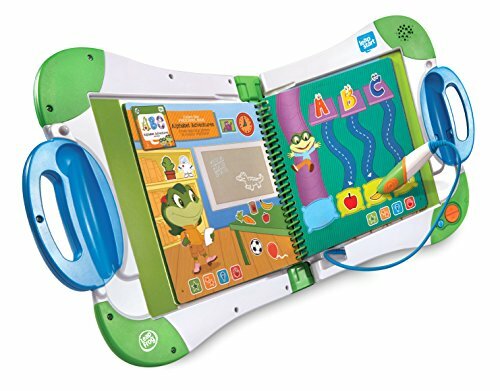 The LeapStart device comes with a taster book with several different sections lifted from the more in-depth separate activity books. It's great to see that children are still being encouraged to read tangible, physical books. Indeed, you can't keep our own kids away from them. And adding a tech aspect to learning will always enhance the process. We only saw a prototype model of the LeapStart, but even that was robust enough for small kids, without being too heavy for them to carry. It will be good to see the final model when it is available.